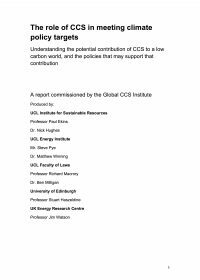 This document aims to fill this void by proposing a definition of CCS ready that could be internationally recognised. The proposed definition reflects the key principles listed below. These principles and the definition are based on an analysis of existing CCS ready literature and legislation, and informed by CCS ready stakeholder perceptions gleaned from a series of international CCS ready roundtables held by the Global CCS Institute. 본 보고서는 국제적으로 인정받는 CCS Ready 플랜트의 정의를 제안하여 현재 부족한 부분을 보완하고자 한다. 제시된 정의(아래 설명 ES-1 참조)는 CCS Ready의 주요 원칙에 입각하였다. 이 원칙들과 정의는 기존 CCS Ready 문헌 및 법률 분석을 통해 내려진 것이며, 여기서 필요한 기타 정보는 지금까지 호주 글로벌CCS연구소(Global Carbon Capture and Storage Institute: GCCSI)에서 개최한 수많은 국제 라운드테이블 회의에서 논의되었던 이해관계자들의 관점 역시 종합하였다. - 기존 플랜트에 CCS를 장착하는 CCS 레트로핏의 경우, 레트로핏에 대한 타당성을 높이기 위해 포집, 수송, 저장과 적절한 조화를 이루어야 한다. - CCS Ready에 대한 정의는 각 관할권의 지역 실정, 정책 또는 시행 방안에 따라 유동적으로 변경될 수 있다. - 신규 CCS Ready 플랜트 건설을 위한 비용은 일반 플랜트를 향후 CCS로 전환하는 레트로핏 비용으로 상쇄됨으로써 정당화된다. - 일반 플랜트는, 레트로핏 전환 시 발생하는 관련 문제를 미리 규명하고 가능한 대응 조치를 강구해 놓는 것이 바람직하다. This report provides guidance to policymakers on deciding whether a CCS Ready Policy is desirable and, if so, selecting different levels of requirements for capture, storage and transport based on jurisdictional characteristics and requirements. They also provide detailed guidelines for policymakers in developing CCS Ready policy, and for regulators in implementing such a policy. CCS Ready플랜트에 대한 명확한 정의는 정책 담당자들이 CCS Ready플랜트의 기본 요건을 개발하는 데 사용될 수 있다. 정책 담당자들을 돕기 위해 이 보고서 본문의 고려 사항 및 추천안에서 제안된 정의에는, CCS Ready 플랜트는 포집, 수송, 저장 각 단계에 대한 준비가 되어 있어야 한다는 개념이 반영되어 있다. 이 3 단계는 서로 밀접한 연관이 있으며, CCS의 성공적인 보급을 위해 반드시 필요하다. 이러한 정의에 근거하여 고려 사항 및 추천안은 CCS Ready 플랜트의 기타 요소(예 : 공장 설계, 장비 사전 투자, 저장부지 선정, 저장부지와 수송 통로 상충 이용 및 권리)를 선별했다. 각 요소에 해당하는 CCS Ready 플랜트에 대한 특정 요구 조건이 세 가지 단계로 제시되어 있다. 마지막으로, 고려 사항 및 추천안은 정책 담당자의 CCS Ready 정책이 바람직한 것인지 여부를 판단하고, 관할권의 특성과 요구 조건에 적합한 포집•저장•수송 준비 공장의 필요조건을 제시할 것이다. 또한 정책 담당자가 CCS Ready 정책을 개발하고, 입법 담당자가 해당 정책을 시행하는 과정에서 참고할 수 있는 상세한 지침을 제공한다. The study forecasts that the amount of pipeline that will be needed to transport CO2 will be between 15,000 miles and 66,000 miles by 2030, depending on how much CO2 must be sequestered and the degree to which enhanced oil recovery (EOR) is involved. The upper end of the forecast range is of the same order of magnitude as the miles of existing U.S. crude oil pipelines and products pipelines. While there are no significant barriers to building the forecasted pipeline mileage, the major challenges to implementing CCS are in public policy and regulation. Because a CCS industry can evolve in several ways, public policy decisions must address key questions about industry structure, government support of early development, regulatory models, and operating rules. Such issues must be resolved before necessary investments in a CCS pipeline system can be made.